Let's look at the one-handed forward swing, contact, the extension and finish. Now it's time for the pay off--producing the forward swing. Let's look at the positioning of the hands and arms, the role of the wrist, the contact point, the finish and discuss the technical combinations and variations that go into creating a gorgeous, powerful, heavy one hander. I want a very firm wrist for developing players, firmer than the forehand wrist position. As the player gets more advanced, the wrist can move or snap in a subtle manner on angles and heavy spin shots. But especially during early developmental, spin should be generated more from the drop of the forearm than the movement of the wrist. A wristy swing will get more spin, but will be unreliable. A firm wrist: difficult to describe but critical in development. The sensation of what is "firm" is hard to describe. But the best way to understand it is to look at the tilt angles of the racquet face during the forward swing. There are two important concepts to understand here, the Tilt Angle and the Break Angle. The firmness or looseness of the wrist and theses racquet face angles are directly related. The tilt angle is the angle between the plane of the racquet face and the plane of the court. I like to see the racquet face vertical to the ground or slightly open in the single-handed backhand preparation and during the backswing phase. This changes in the forward swing. The tilt angle of the racquet face as it drops and starts forward should be somewhere between vertical and slightly closed, a maximum of about 10 degrees. Tilt angle: slightly open in the backswing, slightly closed at the start of the foreswing. If the player can maintain this tilt angle, the wrist will remain relatively still and sufficiently firm. This will promote a clean hit with solid contact and also minimize the potential to shank or miss hit. Players can over tilt and under tilt. Under tilt means the wrist and racket face have opened to the plane of the court. This can make topspin difficult or impossible to achieve. Over tilt, with the face more closed to the court is more common and can help to achieve topspin. But over tilt risks miss hits and the ball lacking depth and penetration. The grip is a factor affecting the tilt angle of the racquet during the backswing. More extreme grips have more severe tilt angles, and thus, more likelihood of miss hits. More classic grips will naturally have less tilt angle and less likelihood of shanks. In general, the more extreme the grip, the more likely the player will miss-hit the ball, especially early on. This relationship is important to understand. But there is also a relationship between the looseness of the wrist and the likelihood of miss-hitting the ball regardless of the grip. A very loose wrist, can help in applying power and spin, but often results in a lack of control and precision. There is a fine balance between wrist looseness and wrist firmness that must be achieved to have a consistent powerful shot with good spin. Heavy spin angles require a slightly looser wrist than others, for example. But if the angle of the racquet face is positioned properly, you can be assured that the wrist is in a sufficiently firm position during the backswing. In the wrap around backswing, the wrist can break slightly backwards and then release into the hit, but this is an advanced element that is difficult to control. The other critical angle to understand with the wrist is what I call the Break Angle. The wrist tilt can make the racquet head too closed. But the wrist can also break back too much resulting in more of a slap shot. I call this the break angle. When we look at the wrap around backswing that is common on the pro one-hander, we may think that the wrist is commonly breaking back because of the angle of the racquet back behind the body. This is really an illusion, though. On many world class shots, the wrist is still firm and has not broken significantly during the backswing. The arm has taken the racquet back and around the body, not the wrist. This is a critical aspect of the swing to understand. However, some players definitely do have a break angle at least on some balls, for example, Justin Henin. This can add additional racket speed and help create spin, but is very difficult to time. If the wrist break angle is extreme in the wrap backswing, a sling shot effect takes place, which can reduce the precision of the shot. The shot will be more of a slap shot—unpredictable and imprecise. Of course, some exceptions can be made for advanced one-handers on a case-by-case basis if the player is gifted and has very good eyes and quick hands. The leg drive can be massive in pro tennis and is key for both power and spin. The leg drive up into the ball is critical to providing power and spin . Too frequently I see players using mostly the arm in the backhand shot. This not only limits the power potential of the shot, but it also increases the stress on the arm musculature and could increase the chance of injury. As the arm drops in the backswing, the racquet head lowers. As the racquet head lowers, the legs can bend tremendously to 45 degrees and often more, preparing for a big push upward into the oncoming ball. As the racquet begins forward toward the contact point, the legs begin to straighten, providing power and lift into the shot. At contact, the legs will usually move from the maximum bend to almost straight on a ball between the hip and shoulder. The feet come up on the toes indicating an excellent push from the quads. At times the legs may straighten out completely, depending on the player's height and the height of the ball. The legs straighten for power and spin, sometimes propelling the player off the court surface. The body may also lift off the ground. In a closed stance, the push from the legs translates into the front-foot closed jump in a forward motion, providing forward momentum and weight transfer. In the open stance, the leg drive creates more rotational force. Many clay court players are using the open stance more commonly and I see it frequently in emergencies and when players are on the run. I think that the open stance will continue to evolve for the single-handed player over the next few decades and will become more and more acceptable. In both cases the leg drive provides more leverage on higher balls near or above the shoulder. Many coaches advise not trying to "jump" into the shot. The argument is that the jump should be a natural byproduct of the leg drive. That may be for developed players at high levels. I train kids to leave the court surface, similar to plyometrics. But in my experience building strokes, players need to learn to activate those quads! I have my players load up the legs and jump consciously into the ball. I want them to get in touch with their lower body and get the maximum drive upward possible. It’s like plyometric training. For me, working on the leg drive is like lifting weights in the gym. Initially, the player has to work hard to make the explosive movement from the legs. The contact point is, obviously, the most critical moment. The player’s arm should be fully extended and straight. All the great backhands have full extension of the right arm at contact with the arm straight at the elbow. Extension promotes both maximum power and good ball feel and control. The racquet face needs to be square to the ball at the contact point, even if it has approached with a slightly closed tilt angle. The reality is that the racket head can be tilted forward slightly, typically on very high balls. But this occurs at high levels of play with high ball velocity and high swing velocity and is not recommended as a teaching point in the developmental phase. With the arm extended contact far away from the body and far in front. Two key points are how far away from the body the contact point actually is with the arm extended, and also, how far in front. For crosscourt shots, the contact point will typically be slightly more in front than on down the line shots. The hip position and shoulder position can vary from shot to shot and from player to player. In general, the more closed the hips and shoulders are at contact, the less power and the more control there will be on the shot. Interestingly, in world class one-handers, there is some hip and shoulder rotation before the contact, as John Yandell has shown in an article in this same issue. (Click Here.) This is related to the use of closed stance, which naturally increases the body turn in the preparation. So there are definitely some rotational forces at work on the professional level single-handed shot. Pro players generally coil up to about 150 degrees and uncoil all the way to 90, the perpendicular point. However, once that left hip and shoulder reach approximately 90 degrees, they stop and anchor themselves as the right arm extends through the contact. Hip and shoulder rotation coming into the contact, with the torso remaining more or less perpendicular after. The single-handed shot is the only advanced shot in tennis where the hips remain relatively still around and after the contact. This relatively perpendicular position to the baseline is critical to maintaining control on the shot. The most common error that I see on the one-handed backhand is the left shoulder and hip rotating through the shot, which may add some power but reduces consistency and control. When combined with a bent arm as it sometimes is at the recreational level, this is a recipe not only for poor shot making but also for injury. However with extreme grips the total amount of rotation can be greater, with the shoulders going past perpendicular before reaching the anchor point. You see this commonly in a player such as Stan Wawrinka. Despite the role of the body rotation, the single-handed shot is still primarily a linear shot. It is one of the last vestiges of the classic linear game. But, it is interesting to see how even this classic stroke has been updated and improved with the more modern swings. More rotation before the contact has added racquet speed, power, and spin. High level extreme grip one-handers tend to have somewhat greater rotation. In terms of developing the stroke, I want to see the left shoulder still at contact and the chest facing the side fence.I prefer to see the same side-on hip and shoulder position for both the crosscourt and down the line shot. With some players, however, the left shoulder and hip may open very slightly for the crosscourt shot. The key, if this occurs, is to make sure that the hips and shoulder are not opening early, compromising control and disguise. If the hips and shoulder open too early the shot direction will be telegraphed to the opponent. As a general rule, clay court players will rotate more through the contact point than fast court players because, over the years, they have learned to hit with maximum pace and spin this way and there is often more time to set up and rotate into the shot. Clay court players learn that they must, with few exceptions, generate maximum racquet speed in every swing. Fast court players often learn to use the pace of the incoming ball better; thus, they will not need to rotate as extremely to generate power. The head and chin: still and balanced during and slightly after contact. One of the most important technical elements in developing the one-hander is keeping the head still during the contact. Everywhere I go I see players flailing away and jerking their heads around during the most important moment in the swing. I call this bobblehead tennis. I feel there should be much more emphasis on head still training. I consider a still head position a hallmark in my teaching and a signature for our students. The head and chin should be completely still and balanced. The eyes should be focused on the contact point for a split second after the ball is hit. Because of the weight of the head, keeping it still is critical in optimal balance. Watching the ball into the contact point creates clean contact and minimizes miss hits. Nothing will disrupt a swing more than a bobbling head. It's hard to stress the point too much. If the head jerks even slightly it can pull the shot offline. I see many good junior players who basically intuit the last few feet of the incoming ball path. These players are estimating--guessing really--where to contact the ball. A still head position is a hallmark in my teaching. Players also have to resist the urge to look up too soon to see where the shot is going. This is critical to disguise as we will see in the next article. Players will sometimes look up in the direction of the shot before actually hitting the ball. Opponents can read this. The arm and racquet should extend straight through the contact point and continue outward on the player's left side, arcing higher until the arm crosses over and reaches a full extension and stretch on the right side of the body. For players who do not extend in this way naturally, it must be extensively practiced and trained. This extension provides effortless power, better penetration, better ball feel, and reduces the chance of injury by promoting a full, long and fluid swing. Often I see players swinging across the body rather than extending out to the left before following through to the right side. If the player does not continue upward through the contact, he will limit spin production and height on the ball. If he does not hit through the ball and extend, he will limit power, depth, and control. The finish on the single-handed backhand is relatively straightforward and simple compared to the forehand. There is less variation here and the mechanical elements are more universally agreed upon. The finish is a great tool to understand what is happening correctly or incorrectly during the contact and extension portion of the swing—it is a mechanical litmus test. Oftentimes a poor contact and swing will result in an unorthodox finish.. The finish, for me, is the least important of all phases of the swing, but it still should be mechanically correct. On the single-handed shot, the arm should be stretched straight and pointing toward the sky. The racquet should usually be perpendicular to the ground. On very powerful swings or more wristy spin shots, the wrist and racquet may release farther and point back toward the back fence. In the pro game, sometimes the finish points back to the rear fence. This comes from extra rotation of the hitting arm, wrist and racket. It's a common finish in today’s pro game, but should only be attempted by advanced players. The key is that his wrist is loosening mostly after the shot—not before. Most beginners will try to copy this swing and get too wristy at the contact. And one final point about the finish. During some quick exchanges, such as when hitting a passing shot, the finish may be abbreviated to allow for a quicker recovery for the next shot. 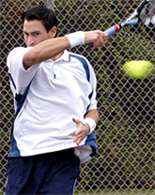 This technique, however, should be minimized because it can develop into a bad habit, causing a swing to become too short in general and hurting extension and racquet speed. So that's it for the forward swing. Next let's look at the critical element of disguise, as important as the technical swing development in creating a worldclass one-hander.